A tidal wave of tax foreclosures threatens our city in 2015. Wayne County has already opened the floodgates with a petition to foreclose on 62,000 Detroit properties by April 1— including an estimated 37,000 occupied homes. Families struggling with job loss and low wages are now threatened with homelessness by a system that serves absentee investors, speculators, and banks. Every Detroiter has something at stake in the fight to halt this looming disaster. Even if your home wasn’t posted with a recent notice of foreclosure, one or more of your neighbors were. If they are forced from their homes, the resulting fire sale of their property will further depress the value of your house, especially when empty homes are stripped by scavengers. We need to organize for the emergency measures that will stop blight before it happens. 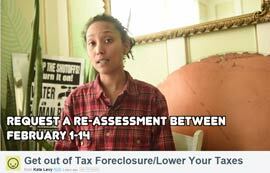 See video by United Community Housing Coalition that explains clearly what to do to avoid tax foreclosure. Layoffs, medical emergencies and other hardships have forced thousands of Detroit families into default on their taxes, their mortgages, or both, setting off a downward spiral of foreclosure and eviction that feeds on itself. As empty houses are vandalized, property values in the poorest neighborhoods fall to less than one-tenth of their inflated tax assessment. Banks have accelerated this downward spiral by refusing to modify mortgages and foreclosing on struggling families, blighting Detroit with an estimated 45,000 empty homes. Speculators and property managers can buy these homes on the cheap, selling some to absentee landlords as rental properties and abandoning the rest to tax foreclosure. Adding insult to injury, homeowners heading towards foreclosure in 2015 for taxes owed from 2012 can be charged interest on the unpaid balance at a punishing rate of 18% a year. Individual families can take the steps outlined below to defend the home they live in, but we’ll need to act together to replace an unjust tax system with one that serves working people. Pay back taxes ONLY to Wayne County. DO NOT pay them to the city, which will only credit your payment to current taxes. The county treasurer has sole responsibility for collecting back taxes and will not retrieve money mistakenly paid to the city. People have lost their homes because the city refuses to transfer the homeowner’s payment to the county. We need to pressure the city to stop this bureaucratic stonewalling. Step Forward Michigan. This state program is supposed to loan money to distressed homeowners to cover back taxes or delinquent mortgages, with the loans forgiven over five years if the borrower stays in the house. It’s worth applying online at stepforwardmichigan.org, but be aware that the program suffers from bureaucratic delay, a narrow criteria for eligibility, and diversion of funds to pay for demolition. In the last four years, the program has assisted only 6,700 families in all of Wayne County. We need to push for more funding and expanded eligibility to keep people in their homes. Banks and other financial institutions that trashed the housing market with their fraudulent foreclosure practices should pay for blight removal, not Step Forward. Taxpayer Assistance from the County. The several programs that homeowners can access on line at waynecounty.com/treasurer/761.htm offer limited relief. The most favorable among them is the Distressed Owner/Occupant Extension: homeowners in financial hardship can get a one-year extension on paying back taxes if the unpaid taxes go back no further than 2012. Upwards of 27,000 households that will otherwise go to foreclosure may qualify for the “DOOE” program. The Michigan legislature has just amended state law to give county treasurers the option to lower annual interest on unpaid taxes from 18% to 6%, and to cut accumulated back taxes on owner-occupied homes to no more than one-quarter of the home’s market value. These reductions only apply, however, if the home has a “primary residence exemption” and the homeowner enters a strict payment plan that many struggling families can’t afford. Interest charges and penalties need to be waived for homeowners in hardship, and payment plans made affordable. United Community Housing Coalition. UCHC is a non-profit organization that advocates for homeowners fighting foreclosure. Its dedicated and over-worked staff will help people negotiate payment-plans with the county and apply for state emergency relief and poverty exemptions. Intake for homeowners seeking assistance is every Monday, Wednesday, and Friday, 9 am to noon, on the 9th floor of 220 Bagley in downtown Detroit, corner of Grand River. Their phone is usually busy, so go in person. Show Cause Hearing. The Wayne County Treasurer’s office has notified homeowners facing tax foreclosure of the Show Cause hearing at Cobo Hall in late January and early February where they can pay back taxes or commit to a payment plan. Staff from the United Community Housing Coalition will be on hand to advocate for homeowners. Tax Assessments. Bureaucratic inertia and state law have driven thousands of Detroiters to foreclosure on the basis of wildly inflated tax assessments. To keep people in their homes, we need a city-wide roll back of assessments to reflect the depressed market values of 2012— with a corresponding cut in excess back taxes. The time for appealing individual assessments should also be extended well beyond the first two weeks of February, when the assessor’s office normally considers appeals. Homeowners can access a six-page manual for individual appeals on the web site of the Historic Boston-Edison Association (written in 2009, it’s still a useful guide). Go to: historicbostonedison.org/appeal.shtml. In the past, the city has rejected many of these appeals because the assessor uses a small sample of comparative prices that excludes distressed sales of foreclosed properties. Mayor Duggan’s initial proposal for reassessing home values is too limited and slow (3-5 years) to stem the immediate crisis. Stop Blight Before it Happens! To save our neighborhoods, we need to keep people in their homes and stop the cycle of foreclosure and eviction that causes blight. Demolishing empty homes only addresses the symptoms, not the cause. We need to call a halt on foreclosures of occupied homes until a city-wide reassessment sets taxable values at realistic levels and cancels back taxes based on inflated assessments and penalties. To make that happen, we need to support families struggling to save their home, talk to neighbors in need, and build a city-wide coalition with neighborhood associations, block clubs, and other allies committed to actions and solutions that keep people in their homes. How to see if your neighborhood is endangered by looming tax foreclosures. On the "Why Don't We Own This?" 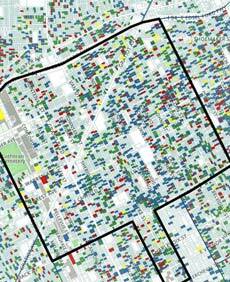 web site, you can see maps of homes facing tax foreclosure in each neighborhood - This is Detroit's Kettering neighborhood. You can zoom in to particular streets & see endangered homes. To see how the foreclosure crisis threatens your neighborhood, visit "Why Don't We Own This?" 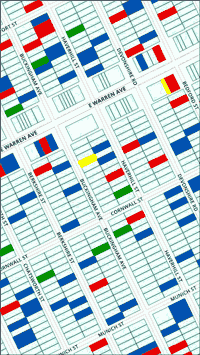 web site that maps every property in Wayne County. That's how they came up with the estimate that 37,000 of the properties facing tax foreclosure may have folks living in them. List of foreclosures in your neighborhood. We urge you to use these maps to reach out to your neighbors and offer support & the information available on these pages. If you'd like an Eviction Defense activist to talk with your neighborhood, contact us at detroitevictiondefense@gmail.com. We need to organize for basic change!